CTEVT (Council for Technical Education and Vocational Training) published a notice about new revised curriculum which applied for old students of educational year 074/075 and new students of educational year 075/076. Check Complete Notice Here. As their notice CTEVT provide new revised syllabus for diploma and certificate levels. 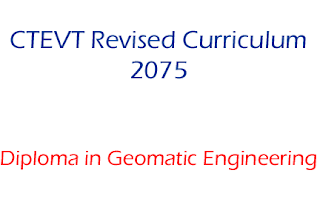 Check Diploma in Geomatic Engineering Syllabus New Revised 2075 - CTEVT below.